“There’s another one, just up the side of the hill.” My wife, Suzanne, had spied yet another wild apple tree on our property, just one of a couple of dozen we had discovered on our afternoon hike. “This one’s full of beautiful dark red apples!”, she exclaimed with surprise. “Yeah, but are they going to be edible?”, I wondered. It was late October 1985, just weeks after we had signed the final purchase agreement with our Ashe County real estate agent, giving us possession of our new mountain land high above the banks of Big Horse Creek. We had driven up from our home outside Raleigh for an extended weekend of camping and exploration of this “wild”, new land. Using new topo maps and an old survey plat map given to us by our real estate lady, we had spent most of the morning hiking the perimeter of the 75+ acres we now owned. It was a beautiful fall morning, crisp and cold, with a clear, clean sky so agonizingly blue it almost hurt your eyes to stare at it. Being late autumn, most of the trees had shed their leaves, but there were still scattered patches of yellow, orange and russet all along the rocky hillside, lending a bit of dying color to the graying, slowly winterizing landscape. What I found surprising and delightful on our hike that day were the amazing numbers and variety of wild apple trees scattered across the land. They varied greatly in size and age, from small, healthy seedlings to ancient, decrepit giants and occupied every available environmental niche. Dark, wooded coves, streambanks, open meadows, fence lines, brushy edges – all seemed to harbor at least a couple of apple trees. Most of the trees were of bearing age but did not have fruit, having already dropped their apples earlier in the season. However, a half-dozen or more were laden with fresh fall apples of all sizes and shapes, dazzling us with color and temptations of flavor. We sampled every ripe apple we encountered. To say we were disappointed would be a huge understatement. Nearly every apple we bit into was a “spitter” – one bite and you spit it out in revulsion! One tree’s fruit was so acrid and bitter it made my mouth feel it had been turned inside out! Another tree had small, reddish-green apples so intensely sour it was impossible to chew. And so it went with every new apple we found. One bite, spit. Bite and spit. Repeat ad nauseum. This all changed dramatically when we found the tree with the beautiful dark red apples. After spotting the tree, we picked our way uphill through the brambles to collect a couple for tasting. The apples were large, somewhat misshapen, with smooth, dark red skin. Plucking a nice-looking fruit from a lower branch, I rubbed it vigorously on my shirt sleeve for a moment to bring out a beautiful red sheen, then took a deep bite. Immediately I knew this beauty was an apple of the highest quality! It was very juicy with a crisp, firm texture that gave way with a solid, satisfying crunch. But it was the flavor, oh the flavor, that captured my attention! The apple had an intensely sweet, rich, full-bodied flavor that left me speechless when contrasted with the bitter, flavorless apples we had sampled earlier. The first thought that flashed across my mind was, “This is a keeper!”. The sweetness was of an order I had never encountered in a fresh apple before – a syrupy, sugary, cotton candy kind of sweetness without the slightest hint of acidity or tartness to dilute the sugary goodness. Realizing the high-quality flavor and value of this apple, we knew we had to preserve and protect and, eventually, propagate this tree. We gave it the inglorious name of “Apple #1” and recorded its founding and location for future reference. As fate would have it, there was, indeed, a significant future in store for this apple, a surprising future that would exceed our greatest hopes and expectations. For years afterwards, we enjoyed many bountiful harvests of “Apple #1” and learned how to best savor its finer qualities. From the beginning, it always stood out as an outstanding fresh dessert apple and produced a smooth, creamy applesauce, as well. But it reaches its pinnacle of perfection when used as a dried apple. Harvested in mid – late October and slowly dehydrated, it produces a soft, chewy dried fruit that could pass for the finest apple candy! 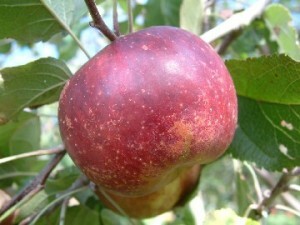 With the debut of our website, www.bighorsecreekfarm.com, in 1999, we began propagating the apple for wider public distribution. For a long time, we had grafted trees for numerous friends in different growing zones and had been very pleased, but not particularly surprised, by the increasing popularity of this sweet red apple. Before offering “Apple #1” for sale through our website, we had renamed it “Husk Sweet” in recognition of the small mountain community where our farm was located. Described on the website as having a “honey-rich sweetness”, Husk Sweet quickly became one of our most requested varieties and was now growing in many states across the country. With its wider distribution in different growing environments, a very interesting fact began to emerge about Husk Sweet. This was its remarkable adaptability to very hot and humid climates. Normally, most apples fail miserably in this kind of stressful environment but Husk Sweet demonstrated its mettle by not only surviving these conditions but actually thriving under the kind of heat that would destroy most other apples. This unique feature caught the attention of many growers and collectors. At this point, I would like to introduce our friend and fellow collector/orchardist, Kevin Hauser, of Kuffel Creek Nursery, a specialized apple tree nursery located in southern California. Kevin has been dedicated to finding heat-resistant apples capable of surviving the “blast furnace heat of Southern California”. His search has focused primarily on many of the heat-tolerant Southern heirloom apple varieties. Over the last few years we have contributed several old Southern heirloom apples to this effort, including our great Husk Sweet. In a related undertaking, Kevin has been working closely with several central African countries in a collaborative project known as “Apples for Africa”. Its far-reaching goal is to find apples capable of growing successfully in these regions which can be incorporated into local economies as a viable agricultural commodity. The work has been highly successful as, over the last six years, tens of thousands of apple trees have been planted in Uganda, Zambia, Kenya, Rwanda, Ghana, Tanzania and Democratic Republic of Congo. With great fascination, I’ve followed Kevin’s work for years and occasionally receive updates from him describing his progress. I recently received an email with details of his latest project exploring the possibility of raising specific apples for use in dehydrating facilities in several African countries. To my utter astonishment he said scionwood from our beloved Husk Sweet has been sent to Africa for this specific purpose! Imagine that! A single wild apple tree discovered more than 30 years ago in our back yard here in Ashe County, USA, might possibly become an important agricultural product on the continent of Africa! I recently shared this news with a friend who exclaimed, “Wow! The idea of an Ashe County apple growing in Africa kind of gives me chills!”. And you know what? It gives me chills, too! As always an interesting and information essay. Thanks for sharing the story of the Husk Sweet. Looking forward to tasting a Husk Sweet from my tree grown from scion I received from you. Great story, always find your blogs very interesting and full of information. Thanks for all you have done to preserve the old southern Appalachian Mountain apples.